After six months in a new school, Sam's finally fitting in. He's the one kid with enough talent to hit the winning home run and bring the baseball trophy back to Haggarty Elementary. But Sam's guardian is shipping him off to boarding school before that can happen. With Joey and Roger, Sam sets off to track down the clues and hopefully discover treasure. Just as some puzzle pieces start to make sense, the boys become lost in a labyrinth of underground tunnels, trapped by dangerous thieves and sealed inside an airless tomb. 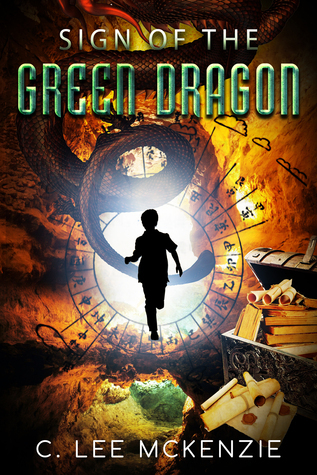 Sign of the Green Dragon gets a high five for fantasy, fun and some fearsome adventure. If you like intrepid would-be knights on impossible and dangerous quests, you'll love this story. As one reader says, this book, "has more twists than a dragon's tail." From the well-developed characters to the intriguing mystery, Lee McKenzie has written a winner of a middle grade novel. I enjoyed everything about this book, but especially the characters. Even the supporting characters were intriguing and a bit of a mystery. Main characters, Sam, Joey, and Roger are believable – equal parts engaging and frustrating, like many boys their age. They get into and out of and into trouble again and again while trying to solve a mystery. Though the characters were a high point, I also enjoyed the cave where Jen and his uncle lived and the taste of Asian culture that we got throughout the book. Really great read for middle graders. You can pick up a copy of Sign of the Green Dragon from Amazon or other etailers. You can find out more about Lee and her other great books on her website. Congrats Lee, Wishing you much success. Fun middle grade book, for sure. Awesome review. I'm sharing the book with my littles. My 9 year old is going to eat it up. Yep! Nothing better than a good mystery. Great review, Kai. Young readers should enjoy solving the mystery along with the characters. Well, older readers, too, like me.